The colleges and universities throughout the Greater Pittsburgh Region contribute to the lives and livelihoods of the residents throughout the area. Besides the education they provide and their growing enrollments, these institutions of higher learning contribute to our economic well being through the people they employ, the salaries they pay, the facilities they make available to the public, and their charitable giving. Over the past decade, Pittsburgh has emerged from the pack as one of the strongest, most economically robust cities in the nation. The universities throughout Western PA have become pillars of the economic foundation of the region, providing employment in the careers of the future and research that has spawned dozens of new technologies. Some of the brightest young minds from around the world are now flocking to Pittsburgh to get the kinds of opportunities that a first-class education affords. Pittsburgh’s colleges and universities are vital partners in the better lifestyle and economic prosperity for which the region has become known. The University of Pittsburgh (Pitt) comprises the 132-acre campus in the Oakland section of Pittsburgh and four regional campuses in Bradford, Greensburg, Johnstown, and Titusville. The University’s more than 13,000 employees include 4,450 full-time faculty members who serve about 35,000 students through the University’s 16 undergraduate, graduate, and professional schools. The 2014-15 academic year also welcomed the University’s 18th Chancellor, Patrick Gallagher, after Mark A. Nordenberg stepped down after leading Pitt for 19 years. 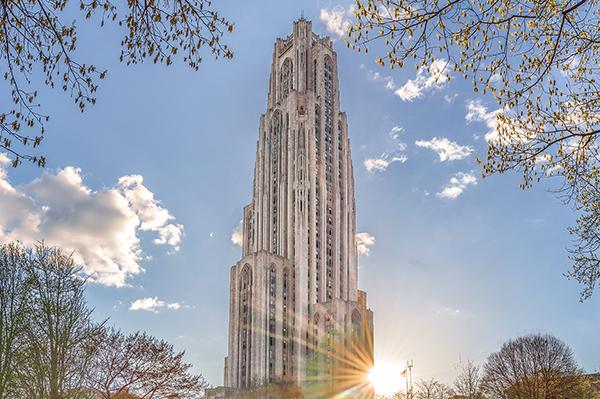 Pitt is the only Pennsylvania public college or university included in the Princeton Review national “Best Value Colleges for 2014” list, based on academic quality, cost, and financial aid. It is also ranked 79th worldwide in the 2013-14 Times Higher Education World University Rankings. The past 15 years have been a special period of distinction for the University. The University awarded more than 100,000 degrees, and its graduates have received many honors, including the Nobel Peace Prize, the Nobel Prize in Physiology or Medicine, the National Medal of Science, the Fritz Medal in Engineering, the Pulitzer Prize for Fiction, and the Shaw and Albany prizes in medicine. Pitt also is one of only four public institutions to have four students awarded Rhodes Scholarship from 2006 through 2015. What’s more, 83 percent of Pitt’s undergraduates and 76 percent of the entire student body come from Pennsylvania and more than 61 percent of its graduates live and work here. Additionally, there are nearly 75,000 Pitt alumni living in Allegheny County alone. In the past decade, Pitt’s research expenditures totaled $5.33 billion. These locally spent funds reflect the institutional stature, support pioneering research, and provide the financial foundation for tens of thousands of local jobs. Pitt now ranks among the top five universities nationally in funding from the National Institutes of Health, joining Harvard, Johns Hopkins, Penn, and the University of California, San Francisco. Pitt’s research strengths have contributed to the launch and growth of such technology-driven, economic-development initiatives as the Pittsburgh Life Sciences Greenhouse, the Robotics Foundry, and the Pittsburgh Tissue Engineering Initiative. In the past decade, technologies developed at Pitt have developed the basis for more than 100 start-up companies since 1996. The University has seen almost 500 new U.S. patents in the last decade and a half. Pitt also sits at the heart of what has been called the education and health services employment supersector by the U.S. Department of Labor. This is now the largest employment sector in the Pittsburgh metropolitan area. Carnegie Mellon University (CMU) is known as a global research university with nearly 13,000 students, 89,000 alumni, and more than 5,000 faculty and staff. Carnegie Mellon is consistently a top-ranked university, recognized for its world-class arts and technology programs, collaboration across disciplines, and innovative leadership in education. Carnegie Mellon University recently selected Dr. Subra Suresh as its new president, succeeding Dr. Jared L. Cohon, who stepped down in June 2013. CMU consists of Carnegie Institute of Technology, College of Fine Arts, College of Humanities and Social Sciences, Heinz College, Mellon College of Science, School of Computer Science, and the Tepper School of Business. Duquesne University has grown to 10 schools offering degree programs at the baccalaureate, professional, masters, and doctoral levels. Students attain a first-rate education, building close relationships with professors and participating in exciting research projects and internships. The main campus is located on 49 acres in Pittsburgh, with 31 buildings and 6 living-learning centers, or student-residence buildings. Current enrollment numbers for Duquesne are 6,038 undergraduates, 3,946 graduate students, including 491 law students for a total of 10,475. About 3,900 students live on campus, including 85 percent which are freshmen and sophomores. The University Core Curriculum emphasizes students’ intellectual and ethical development through the liberal arts. Using the modes of inquiry particular to the humanities and the social and natural sciences, students expand their self-understanding and their knowledge of the world. In the past decade, Point Park University has seen enrollment grow 19 percent, with the 2010-2011 year seeing 4,061 students enrolled at the university. Enrollment numbers for 2013 remain high with 3,841 students. “Our growing enrollment demonstrates that our vision to become one of the most dynamic private, urban universities in America is becoming a reality in Downtown Pittsburgh,” says Dr. Paul Hennigan, President. At the graduate level, the University welcomed 273 new students this past fall. Of those students, 92 percent are from Pennsylvania. Including undergraduate students, however, the students at Point Park represent 44 states and 56 countries. The Academic Village at Point Park University is a living and learning hub that is already transforming the campus. This $244 million master space plan is designed to bring new academic and cultural facilities, architectural and streetscape improvements and greater economic opportunity to the city. Carlow University is a private, co-educational, Catholic university located in the heart of Pittsburgh’s “Eds, Meds, and Tech” district. Founded by the Sisters of Mercy, Carlow’s graduates, curriculum, and partnerships reflect its strong commitment to social justice; ethical, forward-thinking and responsible leadership; and service to the community that has a meaningful impact. Undergraduate and graduate degrees are offered in three major areas: Health and Wellness, Leadership and Social Change, and Learning and Innovation. Carlow graduates are in demand for their entrepreneurial spirit; creative mindset; ability to manage change—and their professional expertise in fields ranging from nursing, the sciences, and perfusion technology to counseling, education, and forensic accounting. Carlow’s eleven athletic teams are known as the Celtics, a reflection of the university’s Irish heritage and roots. Now fully coed, Chatham University is home to nearly 2,200 undergraduate and graduate students. Chatham is comprised of two distinct campuses. The Shadyside Campus and our 388-acre Eden Hall Campus, the world’s first academic community built from the ground up for the study and practice of sustainability. Chatham’s academic excellence is centered around sustainability, the health sciences and lab sciences, business and communications, and arts and humanities. Undergraduates can choose from over 40 majors, and many students find that after scholarships and grants, a Chatham University can be had for about half of the sticker price. Robert Morris University (RMU) provides students with a transformational experience. RMU provides them with an environment that promotes engaged learning, and gives them opportunities to expand their worlds with numerous and varied study-abroad programs. Recently, the university added several degree programs and expanded its honors program. The Community College of Allegheny County (CCAC) is the number-one choice of high school graduates and the largest provider of educational services in Western Pennsylvania with over 54,000 students enrolled. In fact, CCAC has more credit and noncredit students each semester than the universities of Pittsburgh, Carnegie Mellon, Robert Morris, and Duquesne combined. Every year, thousands of students transfer CCAC credits to the four-year college of their choice. With its four campuses and four college centers, CCAC has a location convenient to almost any student in the Pittsburgh area. Additionally, CCAC offers hundreds of courses online with six degrees and six certificates available entirely online. Also, CCAC helps to expand economic opportunities in the Greater Pittsburgh Region. To maximize the institution’s impact on the regional work force, the college is launching three initiatives. The Frieda G. Shapira Center for Learning supports CCAC’s excellent remedial educational programs, partners with public high schools and develops programs to help disenfranchised populations. The Center for Health Careers will develop new models for delivering world-class health care education with improved student outcomes to a more diverse population. And The Center for Professional Development will be the trainer of choice for southwestern Pennsylvania employers by transforming the college’s current workforce training division into a quality-driven, sales oriented enterprise. Penn State University, educates more than 98,000 students, employs more than 40,000 people, and generates more than $8.5 billion annually in economic impact for the Commonwealth of Pennsylvania. Although Penn State’s main campus is located in State College, Pennsylvania, the university has four branch campuses located in the Greater Pittsburgh Area—Beaver, Fayette, Greater Allegheny, and New Kensington. It also has an MBA program located in Cranberry Township. Penn State is a Research-I university with state-of-the-art facilities. Faculty and students are dedicated to collaborating with industry and applying knowledge to make our lives better. Research projects involving more than $800 million are in the works during a given year throughout the University. Highlighting the research effort is a $129-million grant to make buildings more energy efficient. This is the largest grant in Penn State’s history and is believed to be the largest in the history of the Commonwealth. Penn State’s College of Medicine also has received one of the largest grants in its history, with a $54 million grant for asthma research. Penn State Hershey will partner with the National Institute of Health’s AsthmaNet to address the most important asthma management questions and to develop new treatment approaches in pediatric and adult populations. A $54-million Convocation Center on campus is truly a regional asset. This 6,000-seat facility will be used for commencement and other academic gatherings, basketball and volleyball contests, scholastic sports camps, and public events such as concerts and trade shows. With enrollment on the rise, Seton Hill is planning a $75 million campus expansion that will include a new Dance & Visual Arts Center as well as additions to the health sciences complex. The creation of a new Dance & Visual Arts Center will allow all dance and art faculty and students, including those in the Community Arts Program, to be located in one building, leading to the development of a strong community which will encourage the cross-pollination of ideas, the retention of students, and the efficiency of resources throughout the various areas of study. Founded in 1885 by the Sisters of Charity, Seton Hill is now a coeducational university that enjoys a 94 percent student job-placement rate after graduation. Students follow courses in more than 30 undergraduate programs, 12 graduate programs, an Adult Degree Program and an Honors Program. They take courses in five sessions per year rather than semesters, and each session lasts eight weeks. Slippery Rock University offers a broad array of undergraduate and select graduate programs to more than 7,800 students. The University has built its reputation for excellence in physical education into a range of health and wellness programs, including exercise science and a doctorate in physical therapy. The last decade has seen Slippery Rock strengthen both its admission profile as well as its academic profile. SRU achieved its highest total enrollment in the fall of 2010 with more than 8,800 students, a 21 percent increase from its enrollment of 6,952 in the 2000-2001 year. During the same period of time, the average SAT score for an entering freshman rose from 945 to 1018 and the average GPA increased from 2.99 to 3.39. Founded in 1781 and located 30 miles south of Pittsburgh in Washington, Pennsylvania, Washington & Jefferson College (W&J) is one of the nation’s oldest and most distinguished co-ed, four-year, liberal-arts colleges. W&J’s pre-law and pre-health programs are internationally known. More than 90 percent of W&J students who apply to law or health-related schools are accepted. More than 85 percent of W&J’s seniors seeking employment find work in their fields or attend graduate school upon graduation. Washington & Jefferson College, with about 1,500 students is included in the Fiske Guide to Colleges featuring 300 of the “best and most interesting” colleges and universities in the country. Geneva College is a private, four-year, comprehensive Christian college of the arts, sciences, and professional studies. As such, the college enables students to find a pathway to purpose, to find their calling, and to prepare for a life of service and leadership. The college offers an array of academic options and opportunities rooted in liberal arts and science, with associate and bachelor’s degrees that comprise 36 undergraduate major areas of study. Geneva’s 55-acre campus is located in Beaver Falls, Pennsylvania, about 35 miles northwest of Pittsburgh. Founded in 1848 by the Reformed Presbyterian Church of North America, Geneva is committed to a Christian worldview. The Community College of Beaver County (CCBC) is the alma mater to over 45,000 individuals. Students select courses in nine areas that range from Aviation, Business, Computer Information Systems, and Criminal Justice to Culinary Arts, Education, Healthcare, Liberal Arts and Sciences, and Visual Communications. CCBC has an open-door admissions policy, allowing any student with the desire and determination to pursue higher education to do so. And with the lowest tuition in Beaver County, the college’s 3,000 students save money without sacrificing quality. Students enjoy classes with an 18:1 student-faculty ratio, and the college’s occupational programs prepare them for their careers after graduation. Courses at the college transfer to four-year colleges and universities that include four-year institutions like Carnegie Mellon, the University of Pittsburgh, and Slippery Rock University. The college offers 64 associate degree programs, 13 diploma programs, and 49 certificate programs that provide students with the education and skills needed to enter the workforce immediately upon graduation. Students also enroll in WCCC’s associate in arts degree program that parallels the first two years of a bachelor’s degree and then transfer their credits to a four-year university. The college’s articulation agreements with many colleges and universities help to ease the transfer process and to save time and money on the cost of the bachelor’s degree. The Greater Pittsburgh Region is home to many highly ranked, exceptional independent education options that meet the individual needs of children from Pre-Kindergarten to Grade 12. Our independent schools espouse missions that place emphasis on educating the whole child, in addition to extracting and cultivating each student’s fullest potential so that he or she may foster a life-long love of learning. Perhaps one of the most rewarding experiences that our students acquire is the opportunity to learn in a multitude of environments, both geographically and philosophically. The Greater Pittsburgh area is comprised of cityscapes and preserved, natural woodlands. It is not unusual for many of our independent school campuses to house the lower schools and upper schools in different, but convenient, locations. Due to the variety found in the geography of this region and our schools’ expert utilization at incorporating nature in the education of their students, pupils graduate from the independent school system with unique takes on the natural world, learning, and their respective communities. The curriculums in many of our independent schools emphasize environmental preservation and scientific study in a natural setting. Schools such as the Valley School of Ligonier believe that environmental conservation and respect begins with a child’s involvement with the full scope of his surroundings. Additionally, it is through this interaction that students can define their place in the world. With so many institutions of higher learning in our area, many schools also benefit from the resources of local universities and colleges, such as the Carlow Campus School, who shares facilities with the dedicated professors of Carlow University. Relationships such as these help to keep our schools on the cutting edge of educational philosophies and approaches that benefit their students and help retain an accomplished and highly ranked faculty. Falk Laboratory School, affiliated with the University of Pittsburgh since 1931, is known for providing a learning environment that is grounded in community, diversity, experiential education, and individualized instruction. Falk School has a child-centered approach to learning that focuses on the social, emotional, and academic needs of each child. On city-centered campuses, students enjoy the advantage of having Pittsburgh’s thriving technological, medical, and commercial professionals as neighbors and collaborators. The Winchester Thurston School educates their Pre-K through grade 5 students in a peaceful, verdant suburb of Northern Pittsburgh, but utilizes the motto “The City as Our Campus” for their Pre-K through grade 12 campus in Shadyside, creating more choices for learning. They have also teamed up with the University of Pittsburgh’s Asian Studies Department to build a well-rounded Asiatic languages and culture curriculum. Winchester has recently launched a course for seniors on their city campus appropriately titled Urban Research and Design. The Ellis School, Pittsburgh’s only age 3 through Grade 12 independent school dedicated to educating girls and young women, is also located in Pittsburgh’s vibrant East End. Their urban location lends itself to working in conjunction with the acclaimed Robotics Institute of Carnegie Mellon and Google. Their mission includes a dedication to cultivating the use of technology as a vehicle for creating engaged and responsible digital citizens. Technology will continue to play a progressively important role in all of our independent schools, and faculty members appreciate the positive impact it has on learning. Independent schools in Pittsburgh believe that exposure to other cultures produces a more well-rounded student who is poised to create positive change in the world, while simultaneously taking into account the rich cultural fabric of the global community. As globalization has become an integral part of our educational, commercial, and daily lives, our independent schools have strengthened their dedication to providing diverse environments for their students so that each and every child may have educational and social relationships with members of different sexes, races, religions, socioeconomic strata, etc. This helps to maintain an environment that supports inclusiveness; a classroom which is free of bias and prejudice. Included is the emphasis on acknowledging the needs of other community members and to act in service. Many schools continue to set and uphold impressive standards of community service for their students, the result of which is the creation of citizens who share the responsibility of making their schools, cities, and nations better places to live and grow. In the spirit of incorporating balance in the curricula, many of Pittsburgh’s independent schools require, or strongly promote, participation in arts as well as athletics. As a supplement to the academic pursuits of each student, sportsmanship is considered a vital component to building character and supporting a child’s social development. Many of our schools’ campuses maintain state-of-the-art athletic and art facilities, some of which include ice rinks, multiple sports fields, racquet sport courts, Olympic size natatoriums, and golf courses. Some schools’ art facilities include art galleries, dance studios, musician’s practice rooms, learning gardens, and professional performing art spaces and theaters. The University School, a college-preparatory school utilizing individualized tutoring sessions for each student, devotes curriculum to seminars, workshops, art, music, drama, video, and photography. Shadyside Academy’s senior school, located in the verdant and serene suburb of Fox Chapel, hosts public-wide performances of internationally-recognized artists, musicians, and dance companies in their Hillman Auditorium regularly. With a myriad of independent school options in the area, there is a rewarding academic and social experience to meet the needs of every child living in the Pittsburgh region. Our independent schools appreciate that every family’s economic ability will vary, and our region boasts schools that have aggressive scholarship programs that provide educations for bright, curious minds regardless of their background or socioeconomic status. In many institutions, close to 50% of the student body receive some sort of financial aid, making it possible for more children to benefit from an independent education than ever before. There are many students who prefer to board at their chosen school, and the Pittsburgh area has a handful of schools which offer boarding accommodations in supervised and nurturing settings, further preparing their graduates for the college experience. Faculty and administration understand their students’ desires to glean the best preparation for higher learning following graduation, and our independent schools have responded to this need by procuring some of the most highly-educated teachers, counselors, and college counseling professionals in the United States to guide students towards successful admission into the nation’s top colleges and universities. Many of our schools also hold prestigious city, state, and national affiliations and accreditations, such as the Pennsylvania Association of Independent Schools (PAIS), the Pittsburgh Consortium of Independent Schools (PCIS), The National Coalition of Girls’ Schools (NCGS), the International Boys’ School Coalition (IBSC), and the National Association of Independent Schools (NAIS). With extremely impressive student-teacher ratios, talented faculty, geographically and socially diverse learning environments, and a city on the precipice of technological innovation, Pittsburgh’s independent schools continue to cultivate some of the brightest, most promising minds in our city and the world.